A common question at the initial meeting of a family therapist and a new client(s) is often whether or not to include a child or children in the counseling sessions. The inclusion of a child in the family therapy process often changes the dynamic between client and therapist -- and between the clients themselves -- within the context of the counseling sessions. And yet, although this is such a common experience, many counselors and family therapists are not adequately equipped to advise parents on whether to include a child in therapy sessions. Once the child does make an appearance in the counseling session, the therapist is faced with the challenges inherent in caring for a child, in addition to many concerns due to the unique circumstance of the structured therapy. Counseling a child in the context of a family therapy session is a specific skill that has not received the attention that it deserves. This book is intended as a guide for both novice and experienced counselors and family therapists, covering a wide range of topics and offering a large body of information on how to effectively counsel children and their families. It includes recent research on a number of topics including working with children in a family context, the exclusion of children from counseling, and counselor training methods and approaches, the effectiveness of filial play therapy, the effects of divorce on children, and ADHD. Theoretical discussion is given to different family therapy approaches including family play therapy and filial play therapy. Central to the text are interviews with leaders in the field, including Salvador Minuchin, Eliana Gil, Rise VanFleet and Lee Shilts. A chapter devoted to ethical and legal issues in working with children in family counseling provides a much-needed overview of this often overlooked topic. 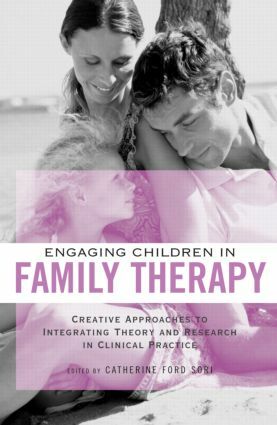 Chapters include discussion of specific skills relevant to child counseling in the family context, case vignettes and examples, practical tips for the counselor, and handouts for parents. About the Editor. Contributors.Series Editor’s Foreword. Preface. Acknowledgments. Part I: Issues Related to Working with Children. Sori, On Counseling Children and Families: Recommendations From the Experts. Sori, Reflections on Children in Family Therapy: An Interview with Salvador Minuchin. Dermer, Olund, Sori, Integrating Play in Family Therapy Theories. Part II: Models for Working with Children and Families: Interviews with the Experts. Sori, Family Play Therapy: An Interview with Eliana Gil. Sori, Filial Therapy: An Interview with Rise VanFleet. Sori, A Playful Postmodern Approach to Counseling Children and Families: An Interview with Lee Shilts. Part III: Conceptual, Practical and Ethical Issues in Counseling Children and Families. Sori, Dermer, Wesolowski, Involving Children in Family Counseling and Involving Parents in Children's Counseling: Theoretical and Practical Guidelines. Sori, Hecker, Ethical and Legal Considerations When Counseling Children and Families. Part IV: Children and Family Counseling with Specific Child Issues. Hecker, Sori, Divorce and Stepfamily Issues. C. Everett, S. Everett, Treating Children and Families with ADHD. Sori, Biank, Treating Children and Families Experiencing Serious Illness. Biank, Sori, Helping Children Cope with the Death of a Family Member. Catherine Ford Sori, Ph.D., is an Associate Professor in the Division of Psychology & Counseling, College of Education at Governors State University in University Park, IL. The Family Therapy and Counseling Series is devoted to providing practitioners and students with current information on specific topics relevant to marriage and family therapy, counseling, couples therapy, and child and adolescent therapy. Forthcoming volumes in the series will explore immigrant families, aging, couples therapy, and parenting.